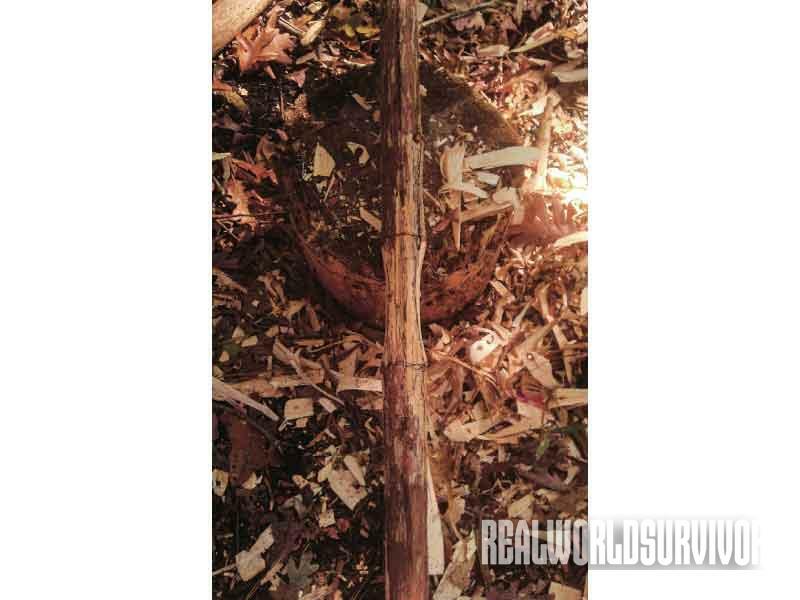 Grab your knife and hatchet and learn how to craft your own survival bow and arrows. 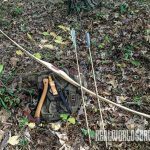 Homemade bows are truly custom shaped to the archer’s hand size and feel. 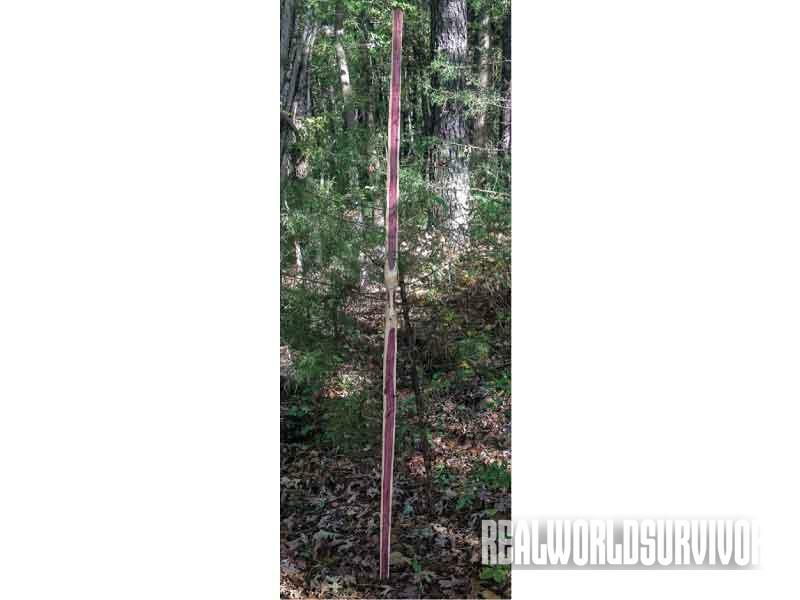 Archery tackle made from found materials, using only a hatchet and knife. Removing the bark from the stave. At this point, only remove the bark. Do not cut into any wood underneath. The stave center lined with handle section marked and limbs outlined, ready to be roughed out. Floor tillering. In doing this, flip the bow around from time to time. Using the knife as a scraper to smooth the belly of the bow. Place one end of the bow against the tree, straddle it and hold it between your knees to secure the work. The bow after being scraped smooth, ready for nocking and final tillering. Cutting the nocks. Be sure to angle the nocks as shown. Try to get the edges and bottoms of the nocks as smooth as possible to avoid wear on the string. Cut them deep enough so that the string on the edge of the bow is almost flush with the wood when seated. The bow strung for the first time. As can be seen, the left limb is slightly stiffer than the right and needs further scraping with the knife. It is hard not to be intimidated when reading about the making of bows and arrows. Stave selection, bow types, arrow spines, Flemish strings, tillering and other aspects are daunting topics for the first-time bowyer. However, being a master woodworker is not necessary to make functional bows and arrows that can be used for sport with targets or game. 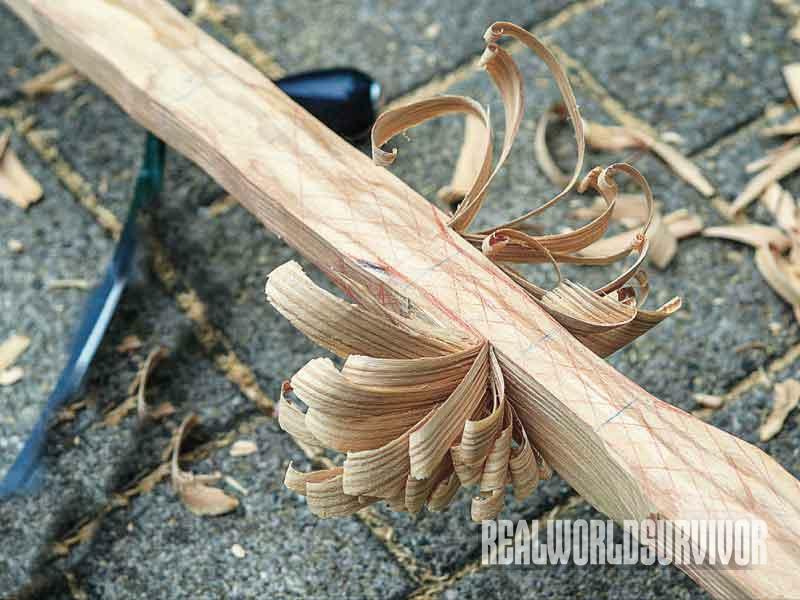 Bow making can be as simple or complex as one wants it to be. 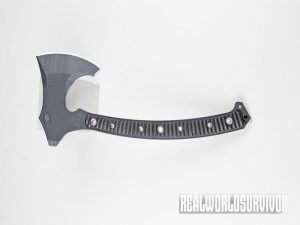 All that is really needed is a good sharp hatchet and knife, and a moderate amount of experience in using both. 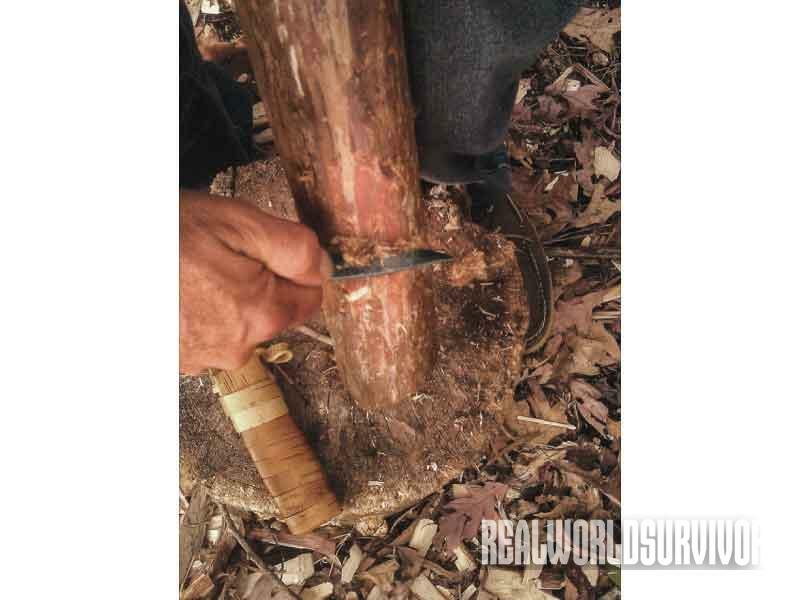 Thus equipped, even a beginner can create functional tools for the wilderness. My archery mentors are many. My uncle, G.P. Scott, first explained the basics of making sapling bows to me when I was an adolescent. Steve Watts once showed me how to make one in about two hours from a dead, standing tree. It helps to have a mentor like Steve or G.P., but much can be learned from reading as well. 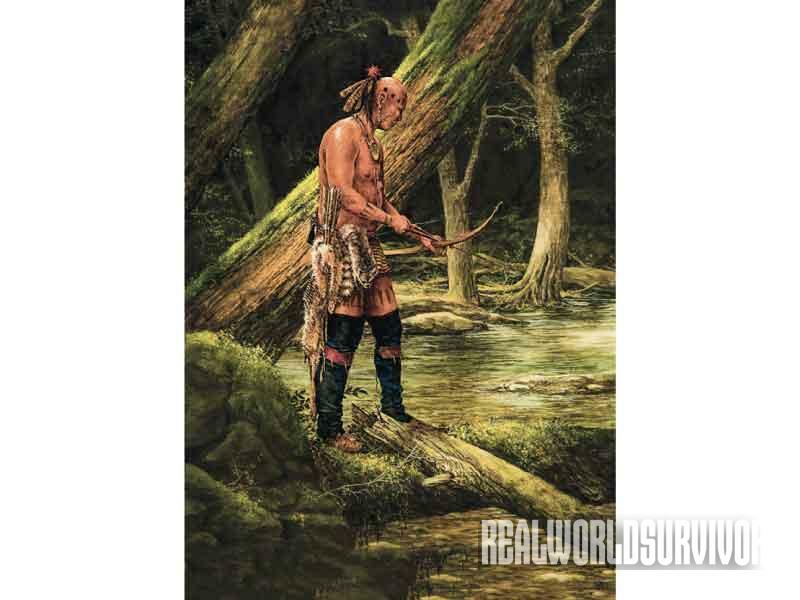 The Traditional Bowyer’s Bible series, Jim Hamm’s book, Bows and Arrows of the Native Americans or anything by Jay Massey are all great choices. Begin by building the bow in this article first and you’ll have a great reference point for future study. A bow stave is the raw material that the bow is to be made from. In this case, the bow will be made from a dead, dry cedar. Bow wood has to be springy and tough. 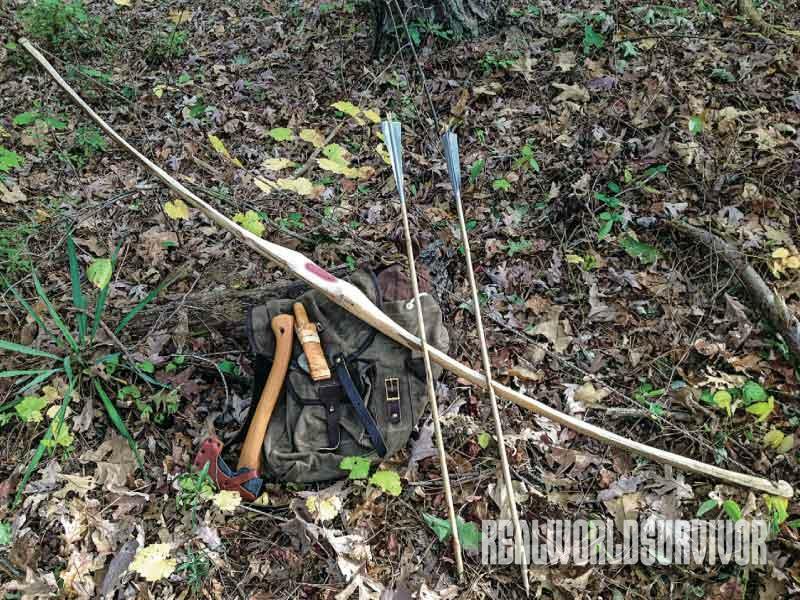 A finished bow must be able to withstand compression in the belly and be able to stretch along its back, so some woods are better than others. Good woods for the type of bow to be discussed here include cedar, hickory, sassafras and the other so-called “white woods” referenced in bow-making literature. 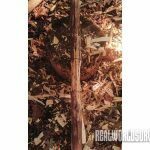 When using “yellow” woods, such as mulberry, Osage orange or locust, the sap wood is usually removed down to a single growth ring of heart wood to create the back of the bow, a time-consuming and tricky process, especially when tools are limited. 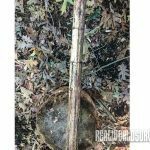 The sapwood just under the bark becomes the back for a white wood bow, so using it simplifies the process, and speeds things up significantly. 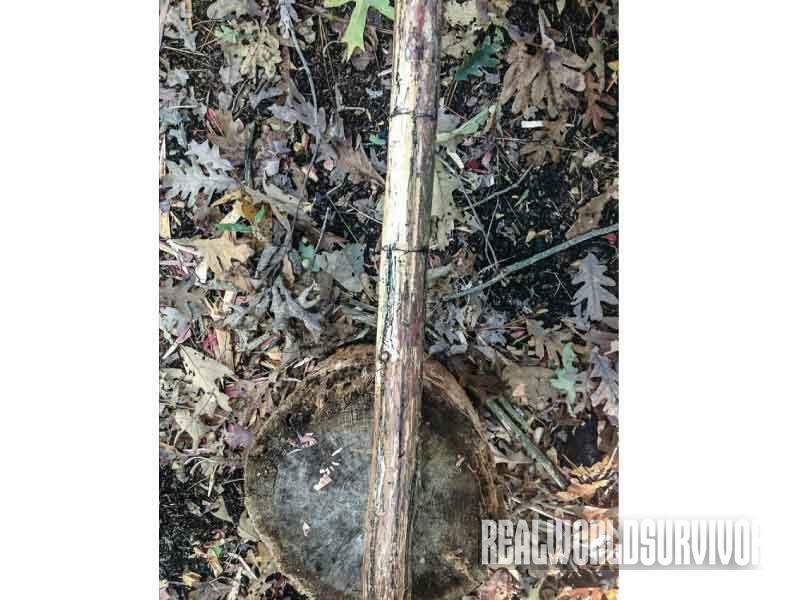 Some of the best trees for staves are those killed in a forest fire, but any dead cedar is a candidate for a bow such as this, as long as it is the right size and not cracked, rotten or insect ridden. Try to find a straight one with as few limbs as possible. Try to avoid large knots that will end up in the limbs. 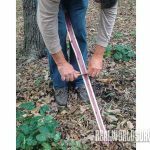 Choose a tree that is about 2.5 inches in diameter in the handle section and a little taller than you are after cutting. The smallest end should be at least 1.5 inches in diameter. Once the stave is cut, evaluate it by skinning the bark from the entire stave, taking care not to cut into the white wood underneath it. Small branches should be cut off just proud of the stave and rounded over later. Leave all bumps and knots intact. Hold your knife perpendicular and use it like a cabinet scraper to remove the bark, so as not to cut into the wood below. Look for cracks on the stave that may compromise the finished bow. Some cracks can be removed during manufacture, others cannot. Also inspect the stave for borer holes and channels. Small ones running along the length of the stave will usually not present a problem. However, if there are wide ones or deep ones running perpendicular to where the back of the bow will be located, they could cause the bow to break when bent. 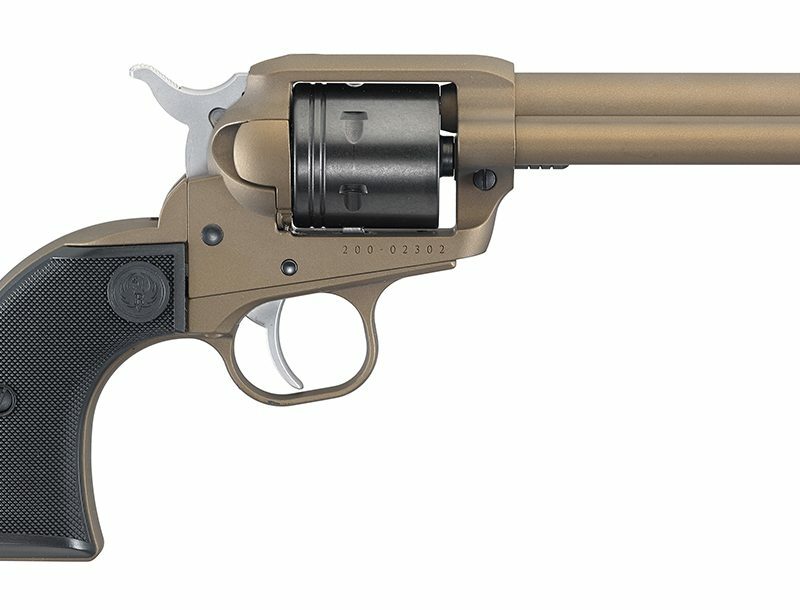 Insect damage in the handle section usually won’t matter. Next, locate the natural bend in the stave. You may be able to see it. If it is not self-evident, place one end on the ground, hold the opposite end and push down in the middle with your other hand to locate the natural bend, which will now be facing the ground. This bend should be followed when making the bow so that the outside of this bend becomes the back of the bow. Center line the stave on the outside of the bend with a piece of charcoal, a pencil, natural pigment or with whatever you have. Sight down the centerline to make sure that the stave doesn’t bend off to one side or the other. At this point, discard the stave if it has any of the flaws previously mentioned. If not, locate the handle section in the center of the stave. Mark the top and bottom of the handle all the way around. Finally, outline the bow limbs, using the center line as a reference. Draw them so that each end will be about 0.75 inches wide, then taper to the handle. The stave is ready to be roughed out at this point. The greatest thing about this method is that nothing has to be done to the back of the bow. Do not remove any wood from the back (the side where the center line is located). It needs to remain intact so that the finished bow does not break when bent. 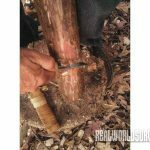 In order to narrow the limbs on each side of the center line, follow the outline with your hatchet or knife. Start at the bottom of one end of the stave, to avoid splitting out, and hew to the line, taking wood off of each side evenly. Be sure to keep every­thing lined up and as even as possible. Stop every now and then to check your work by sighting down the center line. Repeat this on the opposite end. 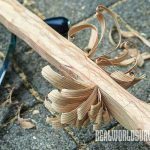 After the rough outline of the bow has been established from the center line, it can be tillered (thinned) so that the limbs can bend evenly and do their work. 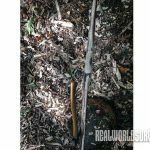 Starting at one end, remove wood from the belly side of the limb until it is about 0.625 inches thick for about 8 inches from the end. Switch ends and repeat. Do not thin these end sections any further. Now the bottom of each limb has been modified on three of its four sides for 8 inches of its length. Next, starting below the handle, gently taper the belly of the bow from the bottom of the handle to the top of the 8-inch section at the end of each limb. Be careful not to split wood off from the ends. This can be done with the hatchet or knife, but care must be taken not to cut too deeply. Keep cuts as smooth as possible. You may want to work toward the handle at times. Take special care just below the handle so as not to remove too much wood, creating a weak spot. As you go, push down on the handle section from time to time as you did when orienting the stave, to check the strength and evenness of the bends. This is called floor tillering. Be sure and flip the bow from time to time, so you can check both limbs. Once things are close to bending evenly, use your knife again as a scraper to tiller and smooth the belly of the bow. Remember, the more wood you remove, the lighter the draw weight (amount of power, measured in pounds, needed to bring the bow to full draw) of the finished bow. The handle can now be shaped by removing wood from each side of the handle. 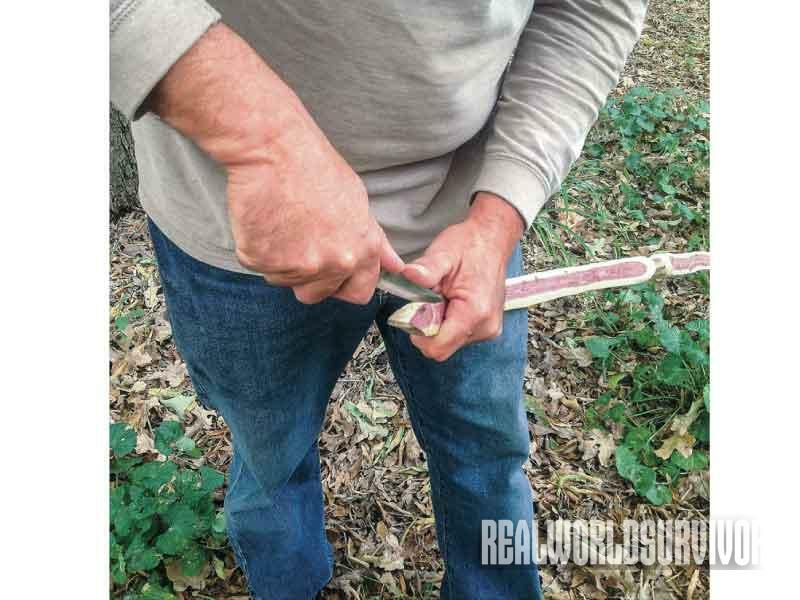 Contour the grip to your hand with the hatchet and knife. Do not remove any wood from the back of the bow, only the sides of the handle section. The belly side of the handle can be further reduced and shaped if desired. Finally, blend in all the curves and lines by using your knife as a scraper to smooth everything up. Take special care to smoothly round off all sharp edges to prevent splitting. Carefully round the edges of the back and belly. Carve in the nocks and the bow is ready for final tillering! If possible, use some sand and a damp stick to smooth the inside of the nocks. This will reduce wear on the bow string. Your bow will only be as good as its string. 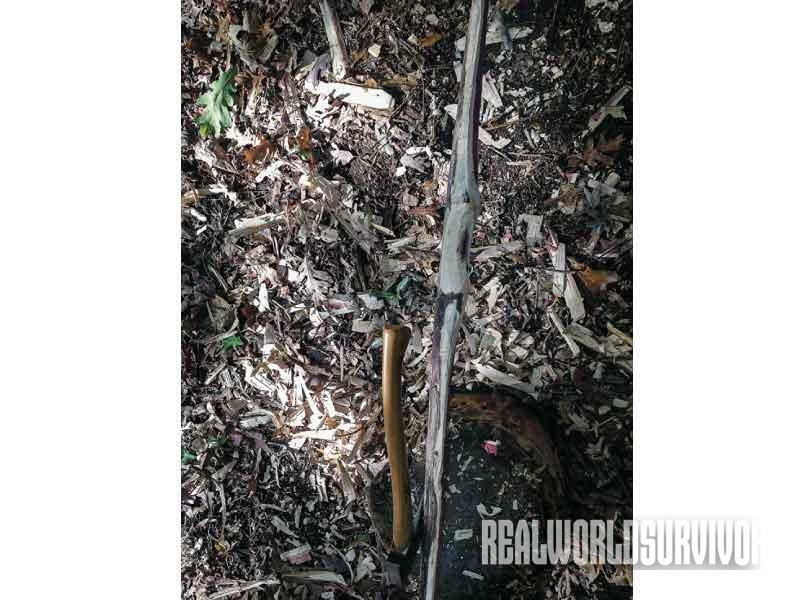 A step-by-step description of basic cordage manufacture is beyond the scope of this article, but a good description can be found in Larry Dean Olsen’s excellent book, Outdoor Survival Skills. 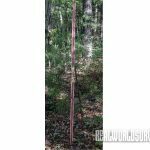 A very serviceable bow string can be corded from dry dogbane fibers. An outstanding string can also be made from spiral-cut squirrel rawhide. 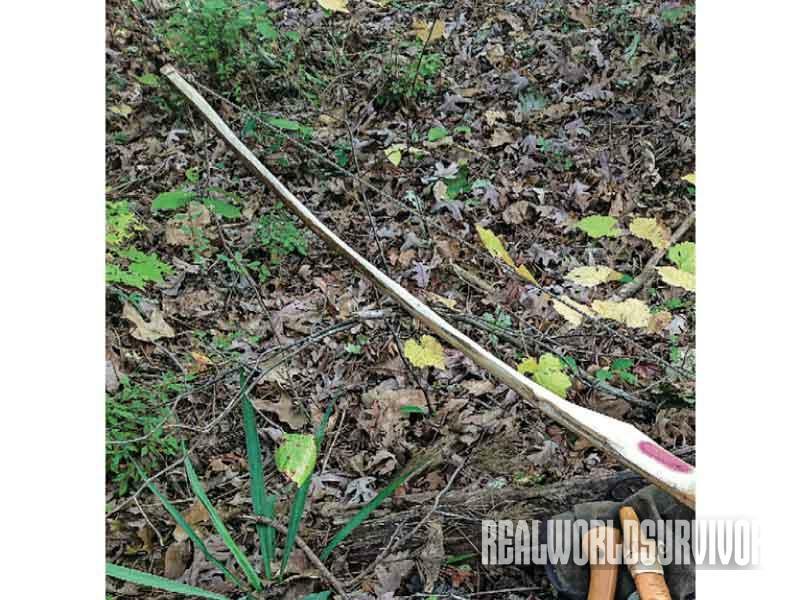 If you are new to bow making and are doing this at home, or have just learned to make cordage and don’t have access to primitive materials, it is easiest to use waxed linen cordage sold specifically for making bowstrings. Hemp string used for making jewelry will also work if waxed, but look for quality material as this type of cordage can have weak spots. It is easier to get a string on a bow for the first time if the bowstring has a loop. To make a string with a loop on one end, first cut six strands of linen string about one and one-half times the length of the bow. Separate into two bundles of three strands each. Step 1: After cutting and separating the strands, stagger the ends of each bundle so that they are about 1.5 inches apart. Step 2: Begin cording the two bundles together below the shortest strand. 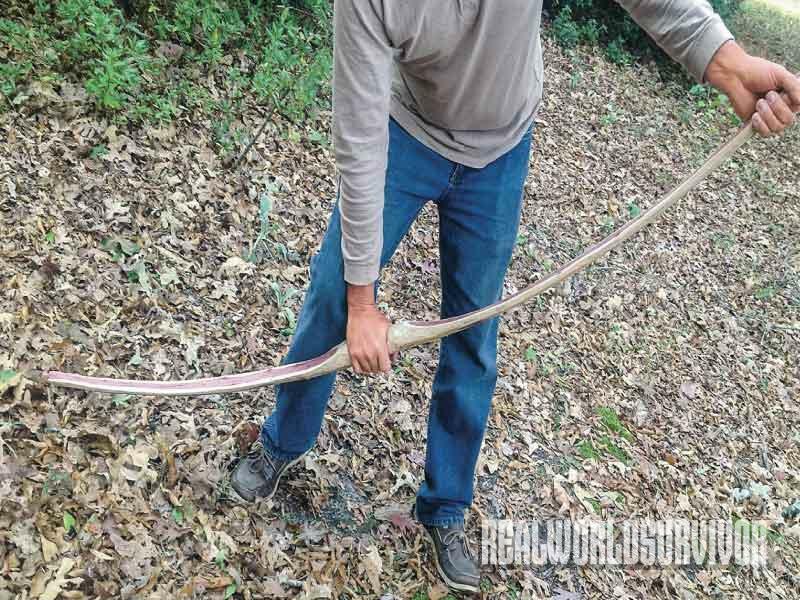 Step 3: Form a loop just big enough to slide about 4 to 5 inches down the bow limb. Lay the staggered ends beside the long ends. Step 5: Cord the bundles together. The importance of the staggered ends now becomes apparent. Step 6: The finished Flemish loop. Finally, cord the rest of the string and tie an overhand knot in the opposite end. 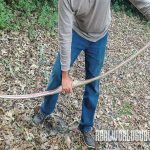 If one limb seems a bit stiffer than the other, it should become the bottom limb since you will be shooting off the top of the grip, in effect making that limb “longer.” Place the Flemish loop over the top limb and slide it down about 4 inches. Tie the other end off on the end of the lower limb with two half hitches. Stretching will probably occur once tension is applied, and you may have to retie the string a couple of times before it settles in. Assuming you are right-handed, step between the bow and the string with your right foot, leaving the string in front of your right leg and the handle behind the right knee. The left end of the bow (the end with two half hitches) should be in front of your left foot. 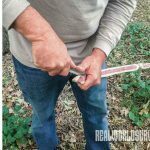 Use both hands to pull the other end of the bow until you can push the loop up and slide it into the nocks. As a visual reference, your fist held vertically without the thumb extended should give you the fistmele, or proper distance, between the string and handle of the bow. You can actually start with just the height of your fist and raise it more later on. If the string is too tight, causing the string to be above fist height, stop and retie the string, making it a little longer. Go slowly when stringing for the first time and don’t overstress the bow. Once you get the string on it, you will want to evaluate how it is bending and perhaps do further tillering. You may not even be able to string the bow at first. If not, it may still be too stout and more tillering will need to be done. The bow can be made weaker by removing more wood from the belly of each limb. Use your knife as a scraper, proceed slowly and check often. Continue to floor tiller until you feel you can get the string on the bow. 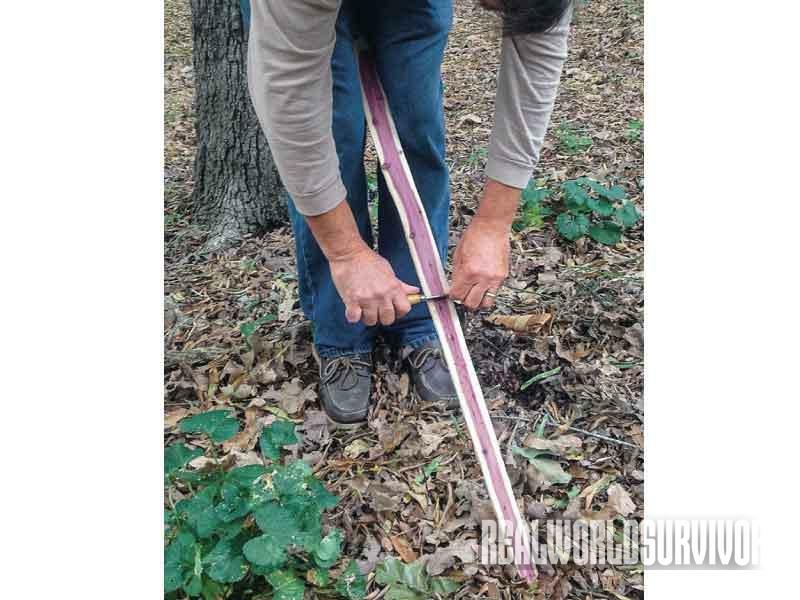 Once the string is on, lay the bow on the ground and check for evenness of bends and stiff or weak spots in the limbs. Mark either side of any weak spots, remove the string, scrape wood off at the location of the marks, replace the string and check again. Put your marks directly on stiff spots, remove the string, scrape these down, replace the string and check. Do this until the bow is bending evenly and is at the proper draw weight. Don’t remove too much wood, especially just above and below the handle. Remember that most of the bending of each limb should occur between the handle and the stiff section above the nock. These bends should be as even as possible. If weak spots have been created, they must be evened out. Remove wood from either side of the weak spot and check the bend again. 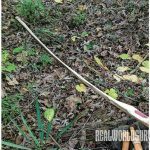 If the bow ends up being too weak, it can be strengthened by shortening each limb and then re-cutting the nocks. If everything looks good, give the bow a final scraping. If fine sand is available, a piece of cloth or leather can be dampened, dipped in sand and used as sandpaper. Clean off the sand, and if grease or fat is available, rub down the wood with the grease. To break in the bow, slowly pull it to half draw about 25 or 30 times. Finally, repeat at full draw. Never release the bow without an arrow nocked, and always unstring it when not in use. Your bow is finished! Now it’s on to the arrows (see accompanying sidebar). As you can see, creating primitive archery equipment demands a diverse set of skills. As Horace Kephart said, “In the School of the Woods, there is no graduation day.” Always continue to step outside your comfort zone, learn more, practice and hone your skills. 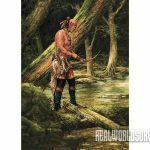 This article was originally published in the AMERICAN FRONTIERSMAN ™ issue #174. Subscription is available in print and digital editions here.